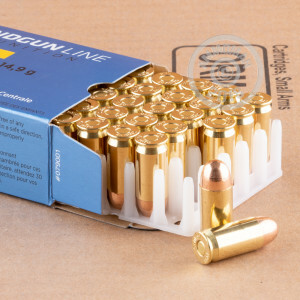 If you want to cut down the cost of .45 ACP ammo without making any compromises in quality, give this Serbian-made ammo from Prvi Partizan a try. 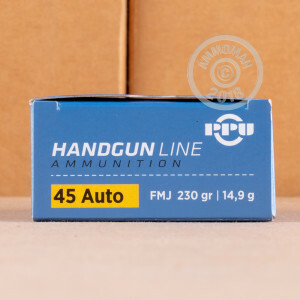 These rounds, packaged in a case of 500 (10 boxes of 50 rounds each) are manufactured to SAAMI standards and use a typical 230 grain full metal jacket bullet to produce a familiar .45 Auto shooting experience. 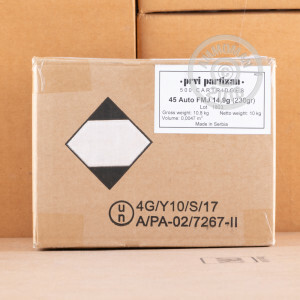 Like all other Prvi Partizan products, these cartridges use non-corrosive Boxer primers and reloadable brass cases. The .45 ACP remains as popular as ever, appearing in both classic firearms like the 1911, Glock 21, and Sig P220 to new models such as the Smith & Wesson M&P, Heckler & Koch HK45, and Fabrique Nationale FNP-45. Its high caliber and low velocity make it a great CCW round, producing deadly expansion in hollow points while presenting relatively low overpenetration risk. Buy this case or any other ammo priced over $99 to quality for free shipping. AmmoMan.com's policy of only charging the list price for large orders makes it the go to site for high volume shooters. Bang for the buck: good, but.. The first 100 rounds I had 3 misfires. Seems this ammo has tougher primers. I recycled them and they fired. Not bad for range use. Shot 100 rounds, no issue. Clean burning. Would recommend.